Blue Banana is fashion with an edge, funky clothes like band/graphic/bubblegum T-shirts, hoodies, corsets and skinnies. With brands varying from Converse all Stars, Hell Bunny, Hello Kitty, Marvel Comics, Newbreed Girl and much more...Though I haven't bought from there yet, I've got my eye on a few things. New Look has some cute leather jackets and cardigans, the one I'm thinking of is is thick, long, has big buttons, pockets and a hood! I've got a fifteen pound voucher for this shop and it's hard to choose what to get. I already got some pj's with the other fiver, there real cute pink with foxes on. I've been thinking of getting some jeggings, since I've never owned a pair before, if I did get them they'd have to be black and look like skinnies. 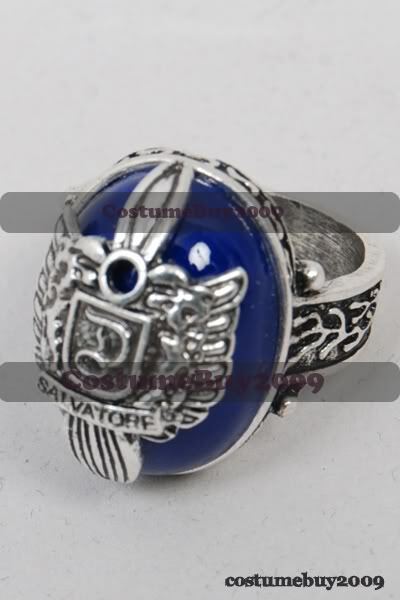 The Vampire Diaries fan jewelery have also caught my eye. A year ago there was a competition to win The Twin Fox Ring, which appeases in Vamp Diary The Return: Shadow Soul. The ring allowed Elena to free Stefan from his prison. Which I didn't win, but have found a similar looking ring on eBay nevertheless. 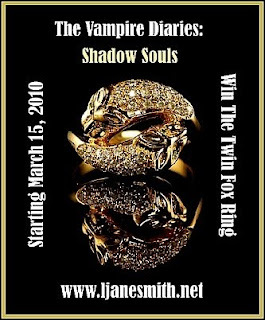 Then the TV show came out (or maybe it came out before hand I don't know) and the crest ring both Damon and Stefan Salvatore weir became available as well. 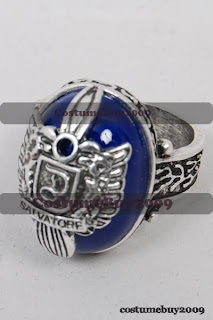 This is silver and is blue lapis lazuli, this ring in the series allows the vampires to walk around in the sun. Also on eBay are hand made, (vamp diary) fan jewelery, of the vervain heart necklace both Caroline and Elena weir. Plus Tyler's moonstone and Bonnie's amber crystal.